John Rutledge (September 17, 1739 – July 23, 1800) was an American statesman and judge who became the first Governor of South Carolina following the signing of the Declaration of Independence. Rutledge was also the second Chief Justice of the Supreme Court of the United States. Rutledge was a member of the South Carolina Assembly, the Stamp Act Congress, the First Continental Congress and the U.S. Constitutional Convention. He served as a presidential elector in 1789, joining in the unanimous choice of George Washington. The final phase of his public career saw him in high judicial positions, first for one year as an associate justice of the U.S. Supreme Court and then as chief justice of the South Carolina supreme court (1791-1795). He was nominated by Washington to replace Chief Justice John Jay in 1795, but the Senate refused to confirm him because of his vehement opposition to Jay's Treaty with Great Britain and because of mental health issues. He thus became the first Chief Justice to be forced out of office involuntarily. He and his younger brother, Edward Rutledge, who signed the Declaration of Independence and also served as the 10th Governor of South Carolina, were fearless patriots during the early years of the new nation. Rutledge was born into a large family in Charleston. His father was Scots-Irish immigrant John Rutledge (Sr.), a physician. His mother, South Carolina-born Sarah Boone Hext, was of English descent. She was only 15 years old when John was born. John’s early education was provided by his father until 1749, when John Sr. died. The rest of Rutledge's primary education was provided by an Anglican priest. John took an early interest in law and often "played lawyer" with his brothers and sisters. When he was 17 years old he began studying law under a man named James Parsons. Two years later, he sailed to England to further his studies at London's Middle Temple. In the course of his studies he won several cases in English courts. After finishing his studies Rutledge returned to Charleston and began his legal career. During his era most lawyers had a difficult time garnering enough business to earn a living. Rutledge, however, quickly emerged as one of the most prominent lawyers in Charleston and his services were in high demand. His successful legal career enabled him to build on his mother's fortune. In 1763, Rutledge married Elizabeth Grimke. They had ten children. Rutledge was very devoted to his wife and her death in 1792 preceded a major decline in his own health. In mid-1765 Rutledge was appointed a delegate to the Stamp Act Congress. This congress produced a resolution that stated that it was "the undoubted right of Englishmen, that no taxes be imposed on them but with their own consent, given personally, or by their representatives." Rutledge chaired a committee that drew up a petition to the House of Lords, and he was responsible for the removal of a concession that acknowledged the British Parliament’s right to impose taxes on trade. When the delegates returned to South Carolina after the Congress adjourned, they found the state in turmoil. The people had destroyed all of the revenue stamps they could get their hands on and they broke into suspected Loyalists' houses to search for stamps. When the Stamp Act went into effect on November 1, 1765, there were no stamps in the entire colony. Dougal Campbell, the Charleston court clerk, refused to issue any papers without the stamps. Because of this, all legal processes in the entire state came to a standstill until news that the Stamp Act had been repealed reached South Carolina in early May of the next year. After the Stamp Act conflict ended, Rutledge went back into private life, and to his law practice. Besides serving in the colonial legislature, he did not involve himself in politics. His law practice continued to expand and he became fairly wealthy as a result. In 1774, Rutledge was sent to the First Continental Congress. It is not known for certain exactly what John Rutledge contributed during this assembly. In the notes we have of the actions of this Congress, the name is given simply as "Rutledge," despite the fact that John's brother Edward Rutledge was also present. In any case, the most important contribution made by "Rutledge" to the Congress was during the debate of how to appropriate votes in the Congress. Some wanted it to be determined by the population of the colonies. Others wanted to give each colony one vote. "Rutledge" observed that as the Congress had no legal authority to force the colonies to accept its decisions, it would make the most sense to give each colony one vote. The other delegates ultimately agreed to this proposal. John Rutledge continued to serve in the First Continental Congress and the Second Continental Congress until 1776. That year, he was elected President of South Carolina under a constitution drawn up on March 26, 1776. Upon taking office, he worked quickly to arrange the new government and to prepare defenses in case of a British attack. In June 1776, Rutledge learned that a large British naval force was moving toward Charleston. 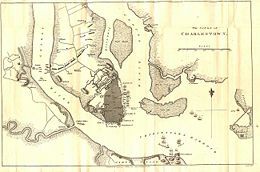 In response, he ordered the construction of Fort Sullivan (now Fort Moultrie) on Sullivan's Island in Charleston Harbor. By the time the British arrived, the fort was only half completed. General Charles Lee of the Continental Army, who had arrived a few days earlier with reinforcements from North Carolina, told Rutledge the fort should be evacuated, as Lee considered it indefensible. Lee said that the fort would fall in under a half an hour, and all the men would be killed. In a note to the fort’s commanding officer, Colonel William Moultrie, Rutledge wrote "General Lee […] wishes you to evacuate the fort. You will not, without [an] order from me. I would sooner cut off my hand than write one"
On June 28, 1776, the British attacked the fort, expecting it to fall quickly. However, the fort’s walls were made out of soft palmetto palm trees, and the British cannonballs simply sank into the logs without doing any damage. The British attack failed. South Carolina later became known as the Palmetto State as a result of this battle. Rutledge continued as President of South Carolina until 1778. That year, the South Carolina legislature proposed a new constitution. Rutledge vetoed it, stating that it moved the state dangerously close to a direct democracy, which Rutledge believed was only a step away from total anarchy. When the legislature overrode his veto, Rutledge resigned. In 1779, Rutledge was elected to head the government of South Carolina under a revision of the new constitution. Governor Rutledge sent a detachment of troops under Gen. Benjamin Lincoln into Georgia to harass the British. The new British commander, General Jacques Prevost, learned what Rutledge was trying to do and sent 2500 troops toward Charleston. When Rutledge heard about the British, he hurried back to Charleston and to build up defenses. In spite of Rutledge’s efforts, when General Prevost arrived outside Charleston, the British force had been greatly increased by the addition of Loyalists, and the Americans were vastly outnumbered. Rutledge privately asked Prevost for surrender terms. Prevost made an offer, but when Rutledge submitted it to the council of war, the council instructed Rutledge to ask if the British would accept a declaration of South Carolina’s neutrality in the Revolution. They forbade Rutledge from surrendering mainly because William Moultrie, who was now a general, believed that the Americans had enough troops to at least equal the British force, which consisted largely of untrained civilians. When given the offer, Prevost replied by saying that as he was faced with such a large military force, he would have to take some of them prisoner before he could accept. Moultrie advised the council that he would never stand by and allow the British to simply take them prisoner, so the council decided to fight it out. The city braced itself for an attack, but the next morning, the British had disappeared. Prevost had intercepted a letter from General Lincoln to Moultrie saying that he was marching to the aid of Charleston, and Prevost decided that he could not hold out if the Americans got reinforcements. A map showing the battle lines during the British siege in 1780. In early 1780, Sir Henry Clinton attacked South Carolina, and Charleston was thrown into a panic. The legislature adjourned upon learning of the British attack. Their last action was to give John Rutledge power to do anything short of executing people without a trial. Rutledge did his best to raise the militia, but Charleston was in the midst of a smallpox epidemic, and few dared to enter the city. In February, Sir Henry landed on John’s Island, less than 30 miles from Charleston, with 5000 troops and was quickly joined by 1400 more from Savannah. Clinton waited for more troops and in May he attacked Charleston with around 9000 troops. The Americans under General Lincoln numbered less than 2500, and on May 10, Charleston surrendered. Rutledge was not captured in Charleston because he had been urged to leave the city. He remained Governor of the unconquered part of South Carolina. On January 17, 1781, the Americans heavily defeated the British at Cowpens, South Carolina. This victory greatly raised the spirits of those in Charleston, but the army was soon outmaneuvered by the better-organized British, and the Americans were forced to retreat. In December, 1781, General Nathanael Greene retook Charleston and drove the British from South Carolina. In January, 1782, John Rutledge’s term of office came to an end, and he was not able to run again, because of term limits. Rutledge around the time of the Convention. Rutledge recommended that the executive power consist of a single person, rather than a plurality, because he felt that one person would feel the responsibility of the office more acutely. Because the president would not be able to defer a decision to another "co-president," Rutledge concluded that a single person would be more likely to make a good choice. When the proposal was made that only landowners should have the right to vote, Rutledge opposed it perhaps more strongly than any other motion in the entire convention. He stated that making a rule like this would divide the people into "haves" and "have nots." It would create an undying resentment against the landowners and could do nothing but cause discord. Benjamin Franklin agreed with Rutledge, saying that such a law would suppress the ambitions of the common people. Franklin also observed that if only people who actually owned land could vote, the sons of a substantial farmer, not having land in their own names, would be denied the right to vote. In 1789, after the Constitution was ratified, Rutledge was appointed to be an associate justice on the United States Supreme Court. Although he accepted the nomination, he never actually sat on the Court. In 1791, he was elected the Chief Justice of the South Carolina Court of Common Pleas and Sessions and resigned his federal post. In 1795, the Chief Justice of the United States, John Jay, was elected Governor of New York. Jay resigned his post as Chief Justice, and George Washington again appointed Rutledge, during a recess of the Senate, to the U.S. Supreme Court, this time as Chief Justice of the United States. 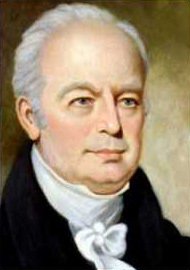 Rutledge became Chief Justice on July 1, 1795. Soon thereafter, on July 16, 1795, Rutledge gave a highly controversial speech denouncing the Jay Treaty with England. He reportedly said in the speech "that he had rather the President should die than sign that puerile instrument" – and that he "preferred war to an adoption of it." Rutledge appeared ignorant of the fact that the president had supported—and the Senate had recently consented to—that treaty. Rutledge's outspoken opposition to the Jay Treaty, and the rumors of mental illness he had suffered since the death of his wife in 1792, caused the Federalist-dominated Senate to reject his appointment on December 15, 1795. As a result, Rutledge's recess appointment automatically expired at the end of that Senate session. Rutledge thus became the only U.S. Supreme Court Justice in history to be forced out of office involuntarily, ending his public career. Alexander Hamilton questioned his sanity, and Vice President John Adams wrote to Abigail Adams that the Senate's rejection of Rutledge "gave me pain for an old friend, though I could not but think he deserved it. C. Justices must not […] inflame the popular discontents which are ill founded, nor propagate Disunion, Division, Contention and delusion among the people." While awaiting Senate approval of his nomination, Rutledge, as acting chief justice, heard only two cases and wrote his only opinion: Talbot v. Jansen (1795). After his rejection as Chief Justice, two suicide attempts, and staving off financial ruin with the help of his brothers, Rutledge began to recover from his depression but his physical health remained shaky. He felt well enough in 1798 to run for a vacancy in the Charleston's delegation to the state House of Representatives. He won unopposed and served through 1799. While the latter part of his life was marred by health and money issues he was nonetheless able to take great pride in his children. John Rutledge, Jr. was elected to Congress in 1796, his sons Edward Rutledge, Jr. and Frederick served in the state Legislature, William became a commission merchant and Dr. Charles Rutledge returned from Spain in 1799. His youngest son, States, received a commission as a midshipman in the U.S. Navy. John Rutledge died on July 18, 1800, at the age of 60. He died in what is now the President's House at the College of Charleston. He was interred at St. Michael's Episcopal Church in Charleston. 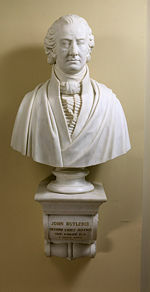 In 1858, more than 60 years after Rutledge’s brief term of service, the bust of the second chief justice joined those of others with that title in the U.S. Capitol’s Supreme Court Chamber. The Supreme Court of the United States–which moved from the Capitol to a building of its own in 1935–replicated the Rutledge bust for its collection in 1976. 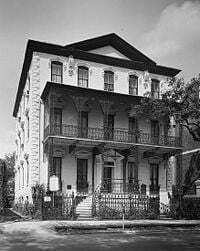 John Rutledge House at 116 Broad St. in Charleston, S.C.
One of his homes was renovated in 1989 and opened to the public as the John Rutledge House Inn in downtown Charleston. He lived at the home on 116 Broad Street from 1763 to 1800. It is one only fifteen homes belonging to the signers to survive and the only one to now provide overnight accommodations. It was designated a National Historic Landmark in 1973. The University of South Carolina's Rutledge College, Charleston's Rutledge Avenue, and Orangeburg's Rutledge Street were named for John Rutledge. ↑ Henry Flanders. The Lives and Times of the Chief Justices of the Supreme Court of the United States Books.google.com. Retrieved December 10, 2008. ↑ James Madison, and E. H. Scott (ed.) Journal of the Federal Convention. (Chicago: Albert, Scott, and Co., 1893) . books.google. accessdate 2008-12-10 Various locations throughout the book. ↑ Louis Fisher, "Recess Appointments of Federal Judges," Congressional Research Service (2001-09-05). ↑ Independent Chronicle (Boston). 1795-08-13, reprinted in Maeva Marcus and James Russell Perry. The Documentary History of the Supreme Court of the United States, 1789-1800.books.google. Retrieved January 8, 2009. ↑ John Anthony Maltese. The Selling of Supreme Court Nominees (Johns Hopkins University Press 1998. ISBN 0801858836), 30-31. 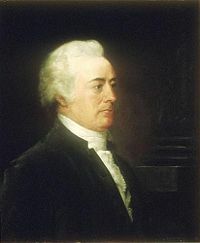 ↑ Biography of John Rutledge Senate.gov. Retrieved December 11, 2008. ↑ National Register Properties in South Carolina Nationalregister.sc.gov. Fisher, Louis, "Recess Appointments of Federal Judges," Congressional Research Service (2001-09-05). Retrieved January 8, 2009. Haw, James. 1997. John & Edward Rutledge of South Carolina Books.google.com. Urofsky, Melvin I. The Supreme Court Justices Books.google.com. This page was last modified on 22 May 2018, at 15:04.